Roaches, spiders, fleas, ants, YEOW!! Kill these and other crawling insects on contact with ARI crawler mauler. No more spoiled lunchroom meals overrun by legions of ants looking for a big buffet. No more running away screaming and hysterical after discovering that spider the size of your fist in the corner of the storeroom. And roaches in the cafeteria? Forget about it! Now you can stand up to these monsters and kill them DEAD with ARI Spider Spray. Always keep a can handy. Remember, you never know when you're going to run into a spider. 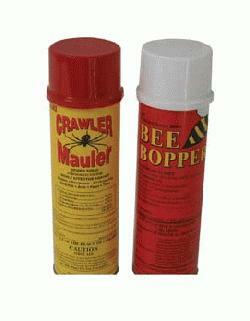 ARI Roach, Spider, and Ant Spray comes in a 15-oz aerosol can. Beware of the wasp with an attitude! You know the one. He hovers above your head contantly, zooming in and out. He intimidates you, and he knows it. Well, he's asking for it, and he's going to get it! With Bee Bopper II you can knock him right out of the sky! And if you happen to know where he lives, you can follow him and his buddies to the nest and spray Bee Bopper up to 20 feet away safely! So arm your employees with Bee Bopper. This powerful weapon kills bees, wasps, and hornets!